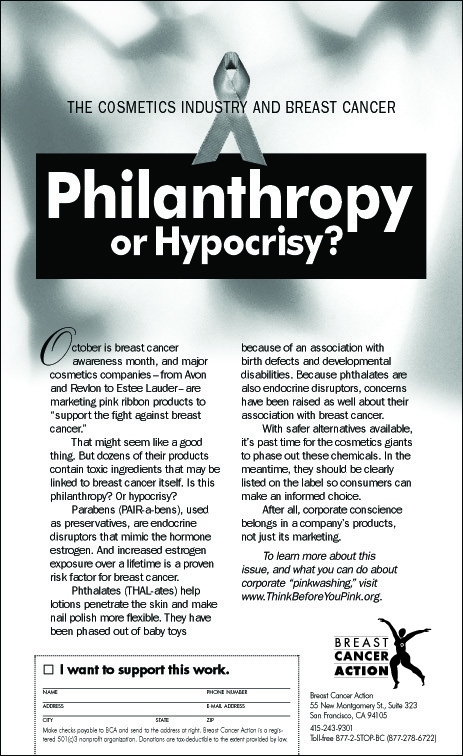 Think Before You Pink » Cosmetics: Philanthropy or Hypocrisy? In 2003, BCA coined the term “pinkwasher,” referring to companies that promote pink ribbon products while the products themselves contribute to the disease. 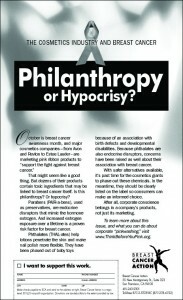 Furthering our work challenging Avon, we focused on cosmetics companies that raise money in the name of breast cancer, but manufacture body care products with known carcinogens or reproductive toxins. We took out a ¾ page ad in the New York Times. First breast cancer organization to identify parabens and phthalates as a source of concern for breast cancer. Parabens and phthalates are often found in cosmetic and body care products. Initiated the California Safe Cosmetics Bill, passed in 2005.